Personal space is a very American mental structure. Please allow me some space to explain. When I get in line to go to the movies, I’m careful not to stand too close to the person ahead of me. That space is theirs, psychologically speaking. I don’t want them to feel crowded and I appreciate the same consideration. When I go into the theater, I don’t sit directly next to anyone unless the theater is packed (no matter how much fun I think it would be to mess with a person). That buffer area is part of personal space. The first time I went to Europe I found myself getting annoyed at how people cut in front of me while I waited in line. It was like I wasn’t even there. This happened several times before I realized that by European standards, I wasn’t in line. Being in line in Germany or France meant you could feel the breath of the person behind you on your neck. I think this is why the early explorers crossed the Atlantic. They needed some elbow room. It also could explain why four out of five Europeans where neck scarves. So now I’ve learned – a line in Europe does not have any open space. You find the end and wait up close to the person ahead of you, all the while hoping the guy behind you doesn’t let loose with a sneeze. If you want open spaces, go to Montana. Parking spaces are another thing we Americans have over Europeans (except maybe in New York City, Washington, D.C., and Costco on the weekend). When Bob and I first visited Europe we made the rookie mistake of renting a car (a mistake we have repeated each trip). Our final day of that particular trip we were in Zürich, Switzerland. We had a few hours to see the city before catching a plane home. Bob was prepared. He printed out maps and directions so we would have them in English. The maps were easy to follow, but unfortunately they often led us to the wrong place. I can tell you from experience that there are a lot of dead-end streets in Zürich. Finally we decided to pull over and get directions, which sounds simple enough except evidently Zürich city planners don’t believe in parking spaces. We looked for one all over the city and finally found one at the airport rental car return. We parked and took the shuttle to our hotel. We’ll see Zürich another time (by bus). Storage space seems to be another American construct. We’ve traveled through eight different countries in Europe, and I have never seen a sign advertising storage units for rent. In all fairness, though, I do not read signs well unless they are written in English – with the one exception of “degustation,” which means “wine tasting.” We stopped just about every time we saw this sign. We visited lots of vineyards, drank lots of wine, and saw no storage units. In Orlando you cannot swing a dead cat without hitting a storage unit facility (or a Starbucks). In case you are reading this and you are from Europe, a storage unit facility is a place where one rents a covered, sometimes air-conditioned space to store the things that have been purchased which don’t fit inside of your house or apartment. These things are so special that they cannot easily be parted with, yet they also cannot be tolerated in the home in which you actually live. Some brilliant person came up with this concept so that we can keep and purchase more stuff than ever thought possible, which is the American way. It also was a good use of the excessive amount of parking lots all over the city, which is why Europe will never have storage unit facilities. Of course, if you go backwards through the history of storage units you will probably end your search with the creators of the hit A&E series, Storage Wars. These guys are brilliant – talk about foresight. On my recent trip to Paris I had the opportunity to challenge a woman’s personal space. 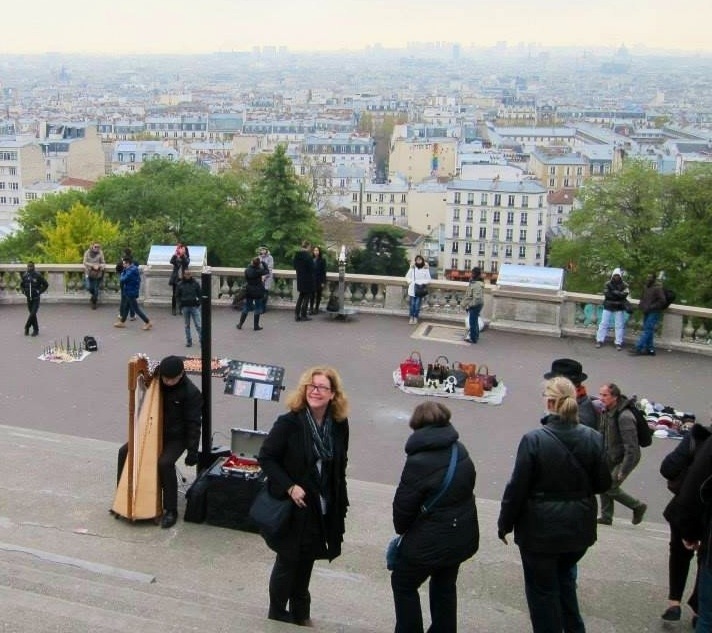 We were at Montmartre, the artsy area on the highest hill that overlooks Paris. 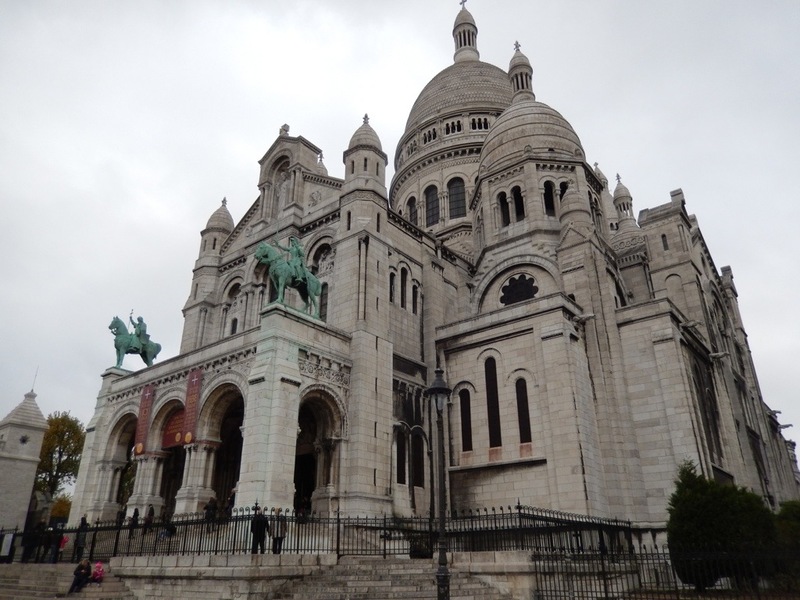 Aubyron and I stood in front of Sacre-Coeur (Basilica of the Sacred Heart of Paris) taking in the view of the city and enjoying the music of a harpist who performed on the steps there. It was the kind of moment that you couldn’t adequately capture with your camera but we were compelled to try anyway. 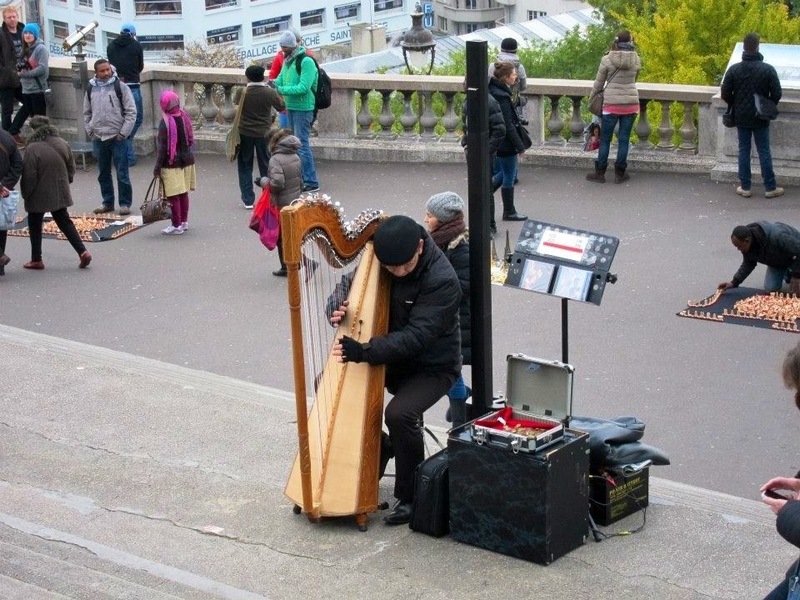 I walked around the top of the stairs shooting pictures from every angle and then came back to Aubyron who was trying to photograph the harpist. She had been attempting to get that picture for five minutes but was hampered by a woman who had put down roots on the step about four feet from the musician and directly in line between him and Aubyron. She seemed to be in her own world and content to stay in that place for the rest of the day. Aubyron was about ready to move on, sadly giving up her picture when I jumped in and said I’d take care of the situation. I left Aubyron with a puzzled look on her face, walked down the steps and stood next to the woman. Now when I say next to the woman, I mean very, very close to her. She looked at me with confusion and I smiled as I planted myself in her personal space all the while feeling a strange mix of being very American and very European. The brunette is the woman who stood there so long. Aubyron snapped this picture of me just as she started to leave. After a few awkward moments, Aubyron took this picture. I suppose we should have given up on the picture or just asked the woman to please move over a little, but I saw no fun in that; and I was fairly certain she wouldn’t have spoken English anyway. Quite honestly, it was an impulse. An impulse that gave us one of our favorite memories from our trip and no doubt gave that woman a funny story about the strange American that crowded her on the steps.